When packing your fragile items for shipping or storage, you should remember you need to protect these items with packaging material that will keep them safe from damage of any kind. You need to be aware of items are packed in the box so that they don’t shift, can withstand being moved by hand or by cart, and can be placed in a car, or stacked in a moving truck or a storage locker. Will it remain resistant under the weight of the item it is supposed to protect? Or will it eventually compress under the weight of the item? Will it withstand multiple shocks? Will it bounce back after one bump or will it compress and not be available to cushion a second bump? Will it withstand changes in air pressure, temperature or humidity? If the package is going to be going on an airplane, or stored in an environment that is not climate controlled, will the cushioning material maintain its resilience? Your package must be sealed securely to ensure that it does not open in transit. Household tape is NOT suitable for courier delivery. All edges where the flaps of your carton meet should be securely sealed with 48mm or 50mm wide plastic or reinforced carton tape. Triangularly shaped cylinders should be used for packaging rolled items such as maps and blueprints. Tubular cylinders are more easily crushed and therefore should not be used. i. Do not tie your package with string as this can get snagged in transit. ii. Do not use Bags made from non-waterproof materials as these can degrade and weaken. iii. Do not use weak single walled ‘supermarket’ type boxes. Boxes should be double walled, rigid and new else their integrity may be compromised. Heavy grades of paper or Kraft paper. These types of paper provide more cushioning protection than old newspaper. Air filled bubble type wrapping. Foam structures – polystyrene shapes engineered to fit around an item for cushioning. Besides cushioning, items may need to be blocked and braced within the box to securely hold them in place during transportation. For example, electronic items often have engineered or moulded protection that comes from the original manufacturer when they ship the item such as corner blocks. If possible, save any specifically shaped blocking and bracing material from an original purchase for later moves. Many of the cushioning materials can be reused for additional packing at a later time. 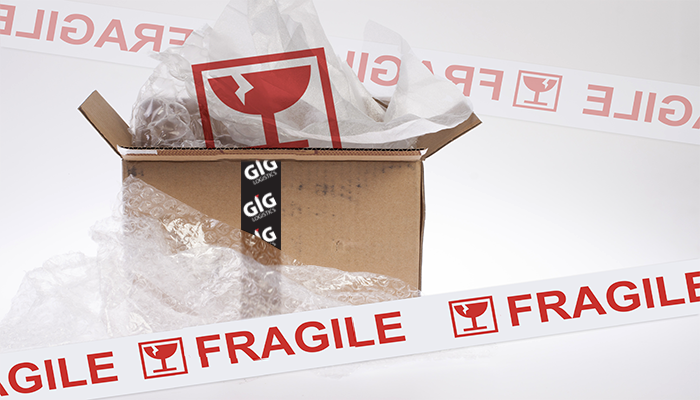 Contact one of our packaging specialists today and get information on the right packing material to us to keep your items safe when sending items with GIG Logistics.